"Imagine if you never had to worry about the appearance of thinning hair again? You can regain that great feeling of confidence you had years ago when a full head of hair was something you took for granted! Hair will look thicker instantly. Bald patch will disappear within seconds. Will stay intact till your next shampoo Regain the feeling of confidence with a full head of hair Easy to apply. Natural look Electrostatically charged to bond with our existing hair. Does not stain or smear. Made in UK Colors Available: Black, Light Brown, Medium Brown, Dark Brown Easy to Apply: -Nanogen Fibres are applied quickly and without mess by simply shaking the unique container over thin or thinning hair. This releases thousands of microscopic colour-matched hair fibres, which bind electrostatically to, and branch off of, each individual hair. Charged with static electricity, they bond to your own hair in fir-tree patterns, creating a natural looking and natural feeling density. Undetectable, Natural Appearance: - Nanogen Fibres actually merge with your own hair, adding real volume, allowing styling like you never again thought possible. Every time you look in the mirror you will be truly amazed by the natural results that are virtually undetectable to the naked eye. Patent Pending Technology: - Nanogen Fibres benefit from a patent pending Electrostatic Coating and Electrostatic Strip. 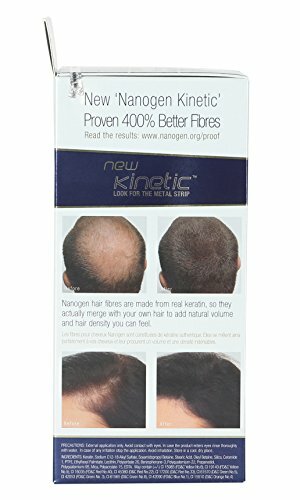 These innovations intensify the hair thickening effect created by Nanogen Fibres. Nanogen Fibres have been independently proven to create unrivalled hair density you can really see. Hazards and Cautions :- For external use only, Avoid contact with eyes, In case of irritation cease use. Look10 years younger in 30 seconds. 30gm Jar will last for approximately 2 months. Approximate Cost Rs 50 per application.